I told you it was a successful day 2 days ago in the Street Gallery...but how successful, I didn´t even know myself at that moment! One of the clients who already bought a painting from me came today to my Gallery and bought a further three and a CD from Kevin (see his entry in his diary). It was wonderful to see how they hardly could decide which one they should buy, they loved so many... what a nice compliment for me! Above all because these people were the same who bought my miniature painting 2 weeks ago, saying that they have no place on their walls. They haven´t indeed, but they have children who still have space... I hope they will like the paintings their parents bought for them today! She sounded a little bit stressed... but whatever she wanted, and however she expressed it, I kept smiling and told her, that I am famous in the area. She was quite happy with that answer and asked me for the price. She didn´t know. She just wanted a painting from a famous painter, I guess. As I told her the price of various ones, she looked very sad. Finally she found a painting which she really loved. It was inspired by a photo from Anne Geddes, featuring a baby in a rose. In fact it was not for sale, it was just to give people ideas for personalised paintings. But my old lady insisted so much that I gave her a price. Of course it was much too expensive, and normally I don´t let people negociate with me. But I felt some kind of sympathy for this woman. 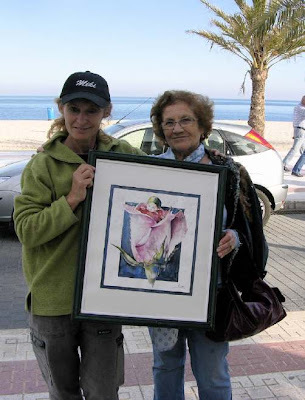 I never had that before but, after 4 rounds, and her leaving and returning each time, finally even showing me the bill for the carpets she had just bought, she succeeded in getting the painting from me for less than half of the price I had first said! I wonder if her husband will really appreciate it, when she comes back home after having spent so much money. But she was very happy, and wanted me to make a photo of her, me and the baby in the Rose!